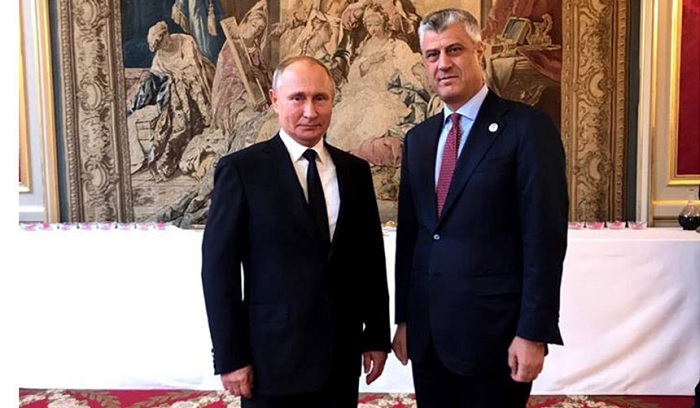 During his stay in Paris, Kosovo President Hashim Thaci met with the Kremlin chief, Vladimir Putin, and as shown himself on the social network Twitter, the main topic of the conversation was the Kosovo-Serbia dialogue. "With President Putin, we focused on normalizing relations between Kosovo and Serbia and achieving a comprehensive and binding agreement. On this topic, Putin was clear. 'If you (Kosovo and Serbia) reach a peaceful agreement, Russia will support it'. (Note: Putin is quoted as saying to his Kosovar counterpart)," wrote the head of the state of Kosovo. Reaching a legally binding agreement is the goal of both sides, as well as a condition for their progress on the path of European integration.